This doctoral thesis presents research on the integration and transfer of knowledge from the specialized field of urban microclimatology into the generic field of urban design. Both fields are studied in order to identify crosslinks and reveal gaps. The main research question of the research is: How can the design of urban neighbourhoods contribute to microclimates that support physical well-being and what kind of information and form of presentation does the urban designer need in order to make design decisions regarding such urban microclimates? This question consists of two parts, which are addressed separately in the first two parts of the dissertation. Part 1 concerns an assessment of relevant knowledge on urban design by literature review, followed by a field study into the use of expert information in the urban design process. Part 2 discusses the influence of the urban environment on its microclimate and, consequently, the living quality of its inhabitants – both by means of literature review. Combined, Parts 1 and 2 serve as a basis for a framework for a design-decision support tool, which is discussed in Part 3. This tool is proposed as a means to integrate knowledge of the urban microclimate into the urban design process, bridging an observed gap. Urban design is concerned with shaping the physical environment to facilitate urban life in all its aspects. This is a complex task, which requires the integration and translation of different stakeholder interests into a proposition for the realization of physical-spatial constructs in the urban environment. Such a proposition comprises different planning elements in the following categories: spatial-functional organization, city plan, public space design and rules for architecture. During the design process, the urban designer has to deal with incomplete, often contradictory and/or changing constraints and quality demands as well as other uncertainties. He/ she handles this complexity by starting with a small selection of constraints, iteratively working to a design solution by incorporating an increasing number of constraints. The selection of constraints is subjective, depending on the design frame of the individual designer. In order to make design decisions, the urban designer requires diverse information. To establish how urban designers collect information and which formats and information levels they prefer, field research among Dutch urban designers was carried out. This consisted of a series of exploratory interviews and an online questionnaire. The results indicate that dissemination of expert knowledge to urban design should be focused on the orientation and sketch phases of the design process and should provide different layers of detail, using mainly visual information accompanied by explanatory text. The results furthermore show a remarkable discrepancy between the assigned significance of the urban microclimate for urban design and the frequency of inquiry on this topic; almost all interviewees and respondents consider the subject to be important, but a majority of them seldom collect information on it. This signifies a gap in the knowledge transfer process. It is important to bridge this gap, because the urban microclimate has a significant impact on the physical well-being of people. All components of the urban microclimate – solar radiation, daylight, wind, air quality and sound – affect the physical well-being of people, whether separately or in conjunction. Some of these effects are immediate, such as heat stress and noise annoyance; others develop over a longer period of overexposure or underexposure, such as pulmonary and respiratory diseases. Some cause discomfort, for example sleep disturbance; others can be life- threatening, such as heat stroke or skin and lung cancer. It is therefore vital that the urban microclimate is given considerable attention in the urban design process. The urban microclimate is to a large extent influenced by the city’s morphology, materialization and landscaping. This influence is exerted through different physical principles, such as reflection, absorption and evapotranspiration. Basic knowledge on how and to what extent the urban environment affects the urban microclimate and of the underlying physical principles, supported by design guidelines and examples/ reference projects, will enable urban designers to estimate the effects of their design choices on the microclimate themselves better, and help them create conditions for urban microclimates that favour physical well-being. In order to make this information available to the urban designer in a way that corresponds to his/her working process, a framework for a design-decision support tool was set up. Requirements regarding form and function were derived from the field of urban design, while requirements regarding content were derived from the field of urban microclimatology. The tool is proposed to be a web-based knowledge base, consisting of five main menu categories: “climate elements”, “plan elements”, “principles”, “guidelines” and “example projects”. Each category provides access to separate pages for underlying items, containing different layers of information, from general to detailed, that can be accessed through collapse menus or click-through functions. Hyperlinks between related items are provided to support different ways to access information. The main menu further gives access to background information on physical well-being and regulations and standards. Separate item pages can be added to a ‘shopping cart’, enabling customised information selection for a specific design at hand. Providing the necessary content for the tool requires further translation of expert knowledge into design information as well as additional research regarding: the plain and simple formulation of physical phenomena related to the urban environment; the integration of expert knowledge of separate microclimatological elements; the incongruity of parameters in microclimatological studies and urban design plan elements; and the presentation of information consistent with design and (design) communication purposes as opposed to evaluation purposes. To illustrate how expert studies can be rendered into design information, the impact of three selected plan elements - Floor Space Index (FSI), Ground Space Index (GSI) and orientation - on solar irradiation and wind was examined with the aid of numerical simulation tools. The results of the calculations for both climate elements were integrated in order to identify conflicts and matches. The emphasis of the study lay on showing trends and generating generic knowledge. Such knowledge is required to fill the proposed design-decision support tool with content. Answering the main research question, it can be concluded that various aspects relating to the morphology, materialization and landscaping of urban neighbourhoods can be employed to create conditions for a distinctive microclimate; urban microclimates often deviate substantially from the regional climate, and even vary within a few meters. Designing urban microclimates needs to be done with care as they affect the physical well-being of people significantly. In order to be able to do this, the urban designer needs information that ties in with his/her way of working and cognitive process. However, expert knowledge from the field of urban microclimatology does not fulfil this requirement and needs to be translated to information for urban design purposes. 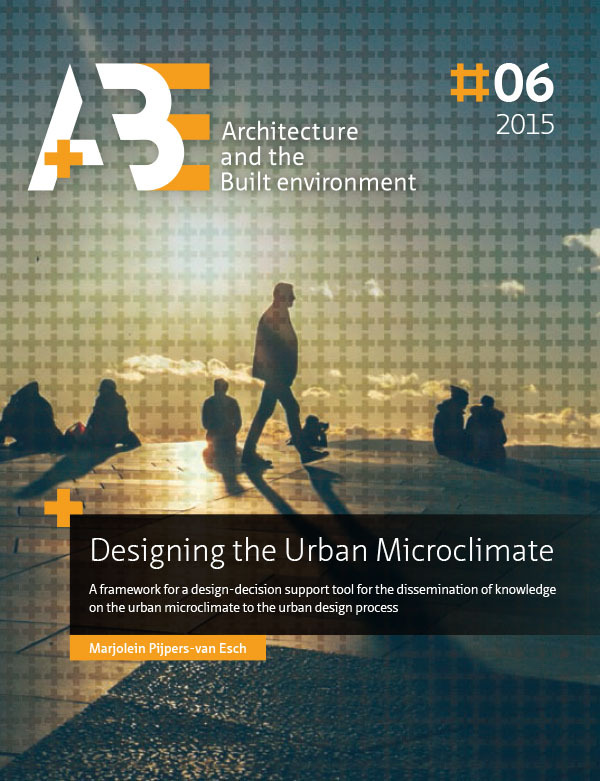 Aiming to give direction to this translation and facilitate the dissemination of expert urban microclimate knowledge to the urban design process, this research proposes a framework for a design-decision support tool. Requirements for the framework were derived from both the field of urban design and the field of urban microclimatology. A tool created according to the proposed framework will enable urban designers to practice climate-sensitive urban design, and, thus contribute to the physical well-being of people.